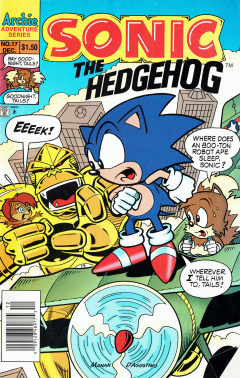 Sonic the Hedgehog 17 is the seventeenth issue of the Sonic the Hedgehog comic series. It was released in December 1994. This comic features two stories: Gorilla Warfare (The Apes of Wrath), and Princess Sally's Crusade Part 1: First Star I See Tonight!. Sonic the Hedgehog is showing off his super speed to the other Freedom Fighters by challenging himself to a game of ping pong. He is able to easily match the speed of the ball, but defeats himself, though leaving the others unamused. He then picks up a handful of darts and throws them at a dartboard with Dr. Robotnik's likeliness on it, stating that things have been too quiet. Elsewhere on Mobius, Robotnik and Snively are on a large flying ship over an ocean approaching an island with an active volcano. They arrive at the island, Skoal Island, and is carried in a chair by four Swatbots, with Crabmeat and Snively following. Crabmeat asks what they are looking for, as Robotnik notes that they are hunting game to help defeat Sonic. He points down to show a shocked Snively and Crabmeat a giant footprint. Snively wonders what kind of animal it is, to which Robotnik tells him that it is 'his boy'. He recalls to when he was younger, a graduate student, when he built a large robot to help with his doctrinal thesis. The one thing he was missing was that spark of life in his robot. A storm conveniently passed by, prompting Robotnik to raise his robot up in the sky, allowing it to be struck by lightning and come to life. The first thing he asked for it to do was to do his chores, but the robot had other things on its mind, and stormed out of his lab. The robot made such an impact, that it left numerous present landmarks on Mobius, but he did not give up, looking for his creation. Eventually, he gave up, after looking high and low for it. Using satellite surveillance photos, climatic shift data and rising tides, he was able to track down his creation to Skoal Island. Suddenly, a large noise is heard that frighten the others, but bring glee to Robotnik. He looks up with joy as his creation, King Gong, arrives: a large golden ape with a clock on its stomach. He asks his fellows to take photos, but Snively and Crabmeat feel it is camera shy and don't want to frighten King Gong. Robotnik, on the other hand, takes photos and has already prepared himself for the encounter with his creation. He blows on a whistle, prompting two Swatbots to bring over a large bundle of bananas. King Gong munches them down, with Robotnik telling it to save room for 'dessert'. Back in Knothole, Sally Acorn and Sonic are preparing a picnic for them and the others. Sonic quickly gathers everything together, including chili dogs, ice cream and bananas. They leave Knothole to meet the others, hoping Robotnik doesn't crash their party, despite his absence over a few weeks. Unknown to them, Robotnik's scheme continues as he King Gong is shipped into Robotropolis. King Gong is released from his shipping container and begins eating a whole bunch of bananas that Robotnik has set out for it. Despite Robotnik's love and confidence in the machine, Snively and Crabmeat still feel he can't have full control of it. With the banana stock running low, Robotnik decides to send King Gong for its next meal by telling it to go after Sonic, showing a picture of him. King Gong leaves, but ends up doing so by crashing through the wall of the building. Back at the picnic, the Freedom Fighters are enjoying a nice meal, until they are disrupted by an earthquake. They look up to see King Gong, looking straight at them, locking its lips. They run away as it moves into the picnic area, but Sally remains confident. She walks up one of King Gong's feet and kicks it, which does nothing, confusing the bot. Sonic runs over and picks up Sally, but the bot suddenly becomes infatuated with her. He puts Sally down as the bot flicks Sonic away far into the distance. He lands on the ground and runs back, only to find King Gong and Sally both missing. Antoine and Tails tells him that it took Sally away and has fallen in love with her. The group decide to go after them, and board the Tornado. From afar, Snively and Robotnik watch as King Gong climbs the Trans-Mobian Trade Center with Sally in tow. The bot has no bad intentions, however, as it shows Sally the sunset from the tower. Despite the king gesture, Sally informs King Gong that she already has a boyfriend. The Tornado then arrives, moving in for a closer look. King Gong takes a swipe at it, and misses. Sonic decides to take matters into his own hands and spindashes into the ape, only to be reflected off of it. He starts to plummet down into the Mobian city, until he is saved by the Tornado. Coming up with another plan, Antoine takes the helm and Sonic brings Tails up to the wing. He throws Tails at King Gong, who flies over and grabs Sally out of the ape's hands. Sonic then takes out a high-pressure super soaker gun from inside the Tornado, and fires it at the bot, knocking it off the tower. Robotnik and Snively, both in a vehicle, rush over to save his creation, only to be smashed by it. Sally and Sonic share a hug over their success. Princess Sally's Crusade Part 1: First Star I See Tonight! It is nighttime, and Sally is sitting on a rock holding a flower. She hopes it can answer her question, and starts picking off its pedals playing a game of "He Loves Me... He Loves Me Not". Unfortunately, the last pedal ends up as 'not'. She sighs and tosses the flower away, reminiscing over a time when she was younger and didn't worry about romance. She recalls when fun was fun, but being a princess, she always has a duty to take over the throne. Unfortunately, that day came too soon for her when Robotnik arrived and spread his evil. She starts crying, wishing she could have a magic wand to wipe her problems away, when suddenly, an object crashes from the sky over a hill near Sally. She gets up and heads over to check it out. Sonic and the others, scavenging a nearby area, also hear the noise and head out. The group meet up with Sally and, using Rotor's metal detector, attempt to find the exact location of the crash. They arrive at the scene, where a large crystal orb stands on top of a dirt crater. Sally goes down to grab it, noting it is cool to touch despite coming from space through the atmosphere. Rotor wonders what it is, but Sally gets an idea, thinking it may be the answer to all her wishes. Elias Acorn is introduced via a throwback. This is the first issue to contain a story which fully focuses on another character than Sonic. Rather than state the credits for the story on the first page of the story, the first story states the credits on the second page. King Gong references the famous large ape King Kong. King Gong becoming infatuated with Sally, and climbing a large tower with her, also references King Kong. According to Robotnik, Irving Pavlov is his second cousin, although Pavlov's actual first name is Ivan.